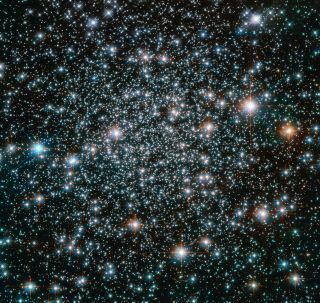 An image of NGC 6496, a 10.5-billion-year-old globular cluster, taken by Hubble and released on June 3, 2016. In 1826, Scottish astronomer James Dunlop located the cluster, which is roughly 35,000 light years away from Earth in the constellation Scorpius. The paparazzi would be out in full force to capture images of these heavy-metal stars, if they weren't cosmic in nature. This Hubble Space Telscope image of NGC 6496, a 10.5-billion-year-old globular cluster, reveals the celestial home of stars comprised of more of the (surprisingly) metallic elements hydrogen and helium than typically found in clusters like this. Using the variability of these stars, astronomers can acquire details about them — mass, radius, luminosity, temperature, composition and even evolution — that may be otherwise unattainable. Scottish astronomer James Dunlop pinpointed NGC 6496 in 1826 in the constellation of Scorpius (The Scorpion), which lies about 35,000 light-years away from Earth. The Hubble Space Telescope launched into space in April 1990 and is a joint project by NASA and the European Space Agency. The space-based observatory has beamed home more than 1 million observations of the universe during its 26 years of service. Using data from Hubble, nearly 13,000 scientific papers have been published, according to NASA officials.